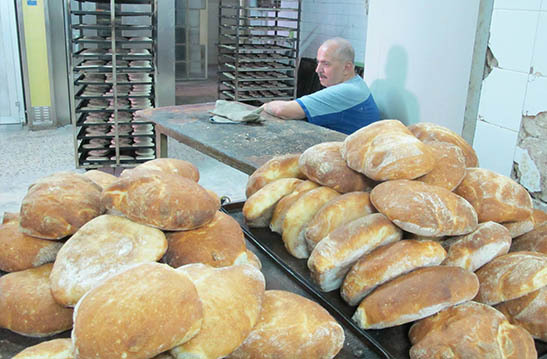 The Salesian Bakery is a historical institution for the people of Bethlehem. It was opened right after the establishment of the Salesian house (1891) to respond to a three-fold need: to internally produce food for sustenance of the young orphans thereby hosted and to Bethlehem families; to serve as a place for learning the baker’s profession, and finally to be an instrument for charitable assistance to the neediest people. Isn’t it apt to offer bread to the needy in the ‘House of Bread’ – Bethlehem? With the outbreak of the second Intifada, this latter function has taken on a more preeminent nature. During the 42 days of the siege of Bethlehem in April 2002, the Salesian Bakery was one of few functioning ones and the only source of sustenance for numerous families in the area, who were able to pass along this basic food from windows and rooftops during the curfew, without leaving their homes, thanks to the contribution of many friends and supporters around the world and to the VIS campaign “Bread for a Brother”. Since the Second Intifada the Salesians have continued to distribute around 26,000 loaves of bread, free of charge, to nearly 200 families in need, carefully selected, either directly or through the collaboration of other religious institutions. The bakery has been repeatedly enlarged to extend production and ensure high quality and working standards for both customers and bakers, who moreover have benefited from several training courses held by internationally renowned bakers. The bakery is always in the improving mode. In the month of June the bakery was rejuvenated with some renovation work. Although the renovation of the structure (as building) is over, yet there are always other works remain pending due to financial constraint. The bakery was helped by many benefactors in the past as it is now. Any donation towards the running of this project is always welcomed and acknowledged gratefully.